There’s no half-assing a fantasy epic. Either you want to draw people into a big, strange new world or you want to keep them grounded in ours. Either you want to transport the audience into a land of magic, unique cultures, and curious histories, or you want to stay Earthbound. Nikolaj Arcel’s adaptation of Stephen King’s The Dark Tower exists in some weird middle ground where it doesn’t have either the inclination or the budget to be truly majestic so it just keeps teasing the audience with thoughts of a bigger, bolder movie. Despite strong performances from leads Idris Elba and Matthew McConaughey, The Dark Tower is too meager to feel grandiose, and too haphazard to feel grounded. An opening title card informs us that the universe is held together by a structure called “The Dark Tower.” If the Tower falls, darkness will engulf the universe. The mind of a child has the power to bring down the Tower. That’s where Walter (McConaughey), aka The Man in Black, a sorcerer comes in. He’s been kidnapping kids and bringing them to his lair to try and bring down the Tower, but it only creates earthquakes in other worlds. Back on Earth, adolescent Jake Chambers (Tom Taylor) has been having visions of the Man in Black as well as Roland Deschain (Elba), a Gunslinger. The Gunslingers were an order of knight-like warriors who tried to take on Walter, but lost, and now Roland, who is immune to Walter’s magic for a reason that’s never explained, is the last one. When Jake travels to Roland’s home of Mid-world, the two team up to take down Walter and protect the Dark Tower. 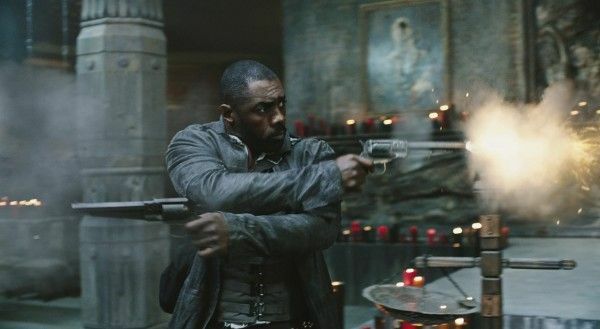 For a movie with a lot of mythology—a sorcerer who leads an army of people with fake skins, gunslingers whose guns are forged from Excalibur, minds that can bring down towers that connect worlds, etc.—The Dark Tower seems petrified of having a personality. The first act largely takes place on Earth with Roland and Walter only sporadically appearing in Jake’s visions. When the movie does finally make its way to Mid-world, it still eschews any imagination whatsoever. Aside from Roland’s outfit, the costumes are bland. The production design is borderline non-existent. The few creatures we see are instantly forgettable and mostly shrouded in shadows as though the animators were embarrassed to have us see their work. For a story that should be brimming with imagination as it tells of a grand battle between good and evil, The Dark Tower is always playing small ball. It’s a movie that rushes from plot beat to plot beat, terrified to spend a second more with its characters lest we start to feel something for them. In the case of Roland and Walter, the movie almost gets away with it because Elba and McConaughey are so good. Elba conveys Roland’s nobility and tragedy while McConaughey is clearly having a ball playing the heavy. Unfortunately, Taylor isn’t a strong enough actor to play the central character. It seems like he was cast because his eyes are as big as saucers, but his line readings are flat, and he doesn’t seem to have much of a read on his character, who functions as audience surrogate, Chosen One, and a way for us to learn more about Roland. At this point, if you’re a fan of the books, you may be wondering how closely the movie follows King’s novels. I’ve never read any of King’s work, but I saw the film with a friend who’s read all of The Dark Tower novels and he told me that the movie takes a few of the characters, a few locations, and that’s it. The story is completely different. So that leaves me (and my friend) wondering who exactly this movie is for. It probably won’t please people who have waited decades to see The Dark Tower on the big screen, and it won’t please audiences who just want a fun fantasy action movie. It’s a film that just sits there, existing out of obligation because studio executives wanted a Dark Tower movie, but they didn’t want to give it the money or the creative freedom to leave an impact. The Dark Tower doesn’t even really do us the courtesy of being laughably bad. That would take some level of ambition, which the movie studiously avoids at almost every turn. Instead, it simply exists, eager to be overlooked and forgotten. It’s a shame that this adaptation didn’t have the funding or the vision to be something remarkable because you can see glimmers of a more ambitious, exciting movie. Sadly, Arcel approaches the story with a flat, uninteresting style, never daring to challenge his audience, invest in his characters, or give us a reason to care. 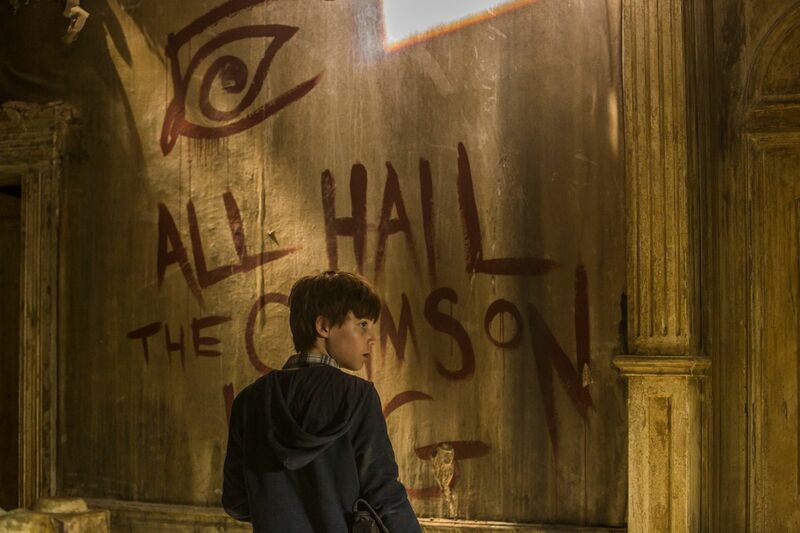 The Dark Tower doesn’t fall because of a child’s mind. It falls because it’s too embarrassed to stand.